nspired by the Uncommon athlete, this eye-catching performance sock from Stance's Fusion Athletic Collection blends state-of-the-art machine and material techniques with artistry of design. We started with an 80/20 fiber blend that offers sweat-wicking properties for advanced moisture management. Then, Stance designed each sock with strategic blocks of performance mesh for enhanced breathability. Anatomical cushioning for your right and left feet and a seamless toe closure means feet stay comfortable, mile after mile. 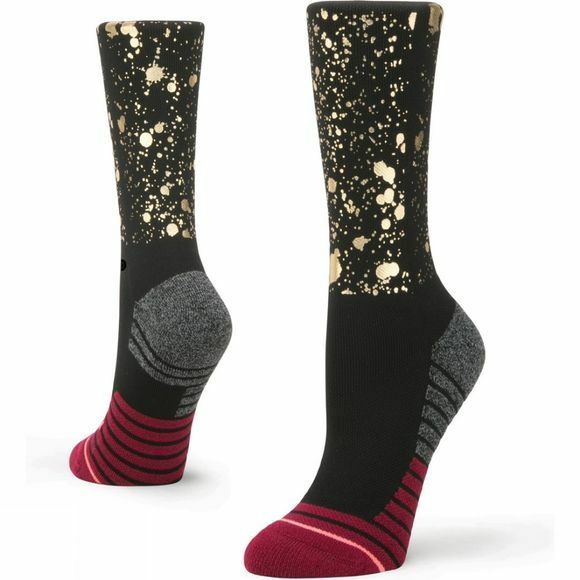 Designed with paint-splatter of shimmering gold, your spirits will always stay high when you’re wearing Stance’s Endorphin.